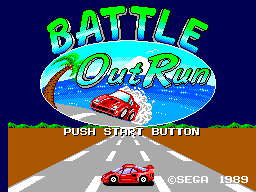 Battle OutRun is a spin-off to the OutRun series, released exclusively for the Sega Master System in 1989. Unlike many other OutRun titles, Battle OutRun was neither brought to Japan or North America, nor has it been ported to any other systems since. Battle OutRun is very similar to Chase H.Q., in that rather than trying to reach a specific destination, you have to find and arrest various criminals dotted around North America. There are many obstacles on the road and it is possible to upgrade your vehicle. You're Joe Hurst, the coolest boundy hunter ever to take the wheel. You're the kind of guy who likes to do tihngs himself. Like building your customer Laborarri Teratuga from odd parts you found in your friend George's tune-up and parts shop. That 'Tuga doesn't run to well now, but man, is it a beautiful machine! All you need is a little cash to make it move as great as it looks. That's why you're on the road right now, trying to collect the bounty on eight of the nastiest mob bosses ever to grace the Most Wanted. These guys are fast. And they're flanked by ferociously loyal thug drivers who'll try anything to slow you down. Once you spot a boss, the only way to stop him is to bash the life out of his car before time tuns out. Otherwise, you'll have to start over, and lose all the great parts you buy alnog the way. Main article: Battle OutRun/Magazine articles.